When 11 year old Martine's house burns down, killing her parents, her life changes forever. Sent to a game reserve in South Africa to live with her strange grandmother, Martine must deal with her grief and learn how to survive in a very different culture. She befriends an albino giraffe and her adventure begins. Along the way Martine discovers secrets and mysteries go hand in hand in her family. This is magical adventure of myth and discovery set against the searing backdrop of the African Savannah. The sights, sounds and smells of Africa seep through every page and it's no surprise to learn that St John spent her childhood in Zimbabwe. I'd recommend this book to children 8 and up and to quite a few adults too. An exciting story with intriguing threads of mystery and mythology throughout. 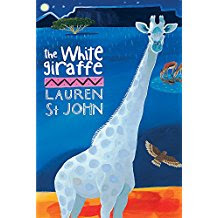 'The White Giraffe' is part of a series by Lauren St John which includes 'The Dolphin Song' and 'The Elephant's Tale'.